← Illusion optics: the physics of making things look like other things! I’ve recently had my eyes opened to the possibilities of horror in graphic novels, thanks to a Halloween post on io9 about “short and spooky webcomics.” One standout in that list is the incredible “His face all red” by Emily Carroll, which I would be so bold as to call a nearly perfect work of horrific art. 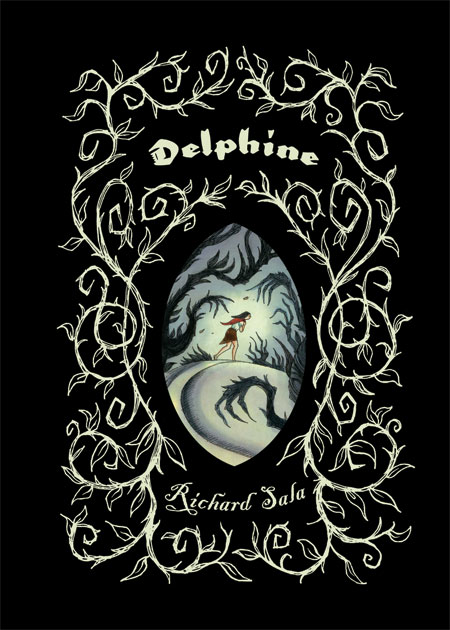 With this in mind, my interest was immediately grabbed by a post on Boing Boing about Richard Sala’s graphic novel, Delphine. Delphine is a dark and unsettling version of the story of Snow White, told from the point of view of the “Prince.” I did not find it quite as perfect as I’d hoped, but it is a quite effective and chilling tale with hauntingly lovely artwork that enhances the story. Set in modern, or near modern, times, the story follows the travails of the unnamed “Prince” in search of the woman he believes to be his one true love, Delphine Penny. As the Prince heads off to London for school, Delphine returns to her childhood home to bury her father… and disappears. The Prince goes to the small town in search of her, and finds a collection of aged and sinister locals who are evasive, deceptive, or actively hostile to him and his quest. As he pushes harder to find his lost love, he delves into the macabre depths of the town — and his own psyche. Delphine is punctuated by flashbacks that add depth to the story and establish the Prince’s motivation. The story as a whole is reminiscent of an extended nightmare, in the best possible way. I only have two little gripes about the graphic novel. One is that the story feels just a little incomplete (or “enigmatic,” as Mark Frauenfelder suggested on Boing Boing). There is a fine line to be walked in writing good, unsettling horror: too much information given, and the story loses its mystery, but too little, and it feels a bit confusing. Where this line lies is a matter of taste, but I felt a smidge more explanation would have worked for me. The other gripe is simply that the story is relatively short! This is probably unavoidable for graphic novels, but I felt like it ended too soon for me. This, however, is also a compliment to the writing, so I guess my gripes sort of cancel out! Overall, Delphine is a really well-constructed horror tale. It was good enough to make me order Sala’s earlier book, The Hidden, which I will review as soon as it arrives! An excerpt of Delphine can be read here, in pdf form. If you’re getting into scary graphic novels, you should look into Beasts of Burden. See, it’s about these adorable puppies and their kitty cat friend and– HEY, WAIT, COME BACK. Seriously, though, it’s amazingly effective horror despite the premise. The animals are pets, not anthropomorphic critters, and they behave basically like you’d expect pets to do. If pets found themselves battling the paranormal to defend their friends and town. Far from being cheesy, in this case it amplifies the horror. They frequently don’t understand what’s going on, they just know that something needs to be done. Hmm… I may have to take a look at it, though I tend to be rather shy about seeing stories where animals are in danger.